In the July issue of Chicago Woman magazine, Symmetry Counseling founder and author of Marriage in Modern Life, Dr. Anne Brennan Malec offers a concise list of “Keys to a Successful Marriage.” This advice comes from her years of professional training and practice as a marriage and family therapist, as well as from her own personal observations and experiences. What follows are some suggestions for how to implement her useful advice. Make your partner and your relationship a priority. Let your partner and relationship be a priority, not only in words, but also in action. Do not let your relationship suffer from neglect. Be proactive by setting aside regular time for your partner and relationship and be thoughtful in considering your partner in your decision-making; don’t wait until you’re in a marriage counseling session to do so, either. Try thinking and using the word “we” instead of “I” when you think about needs and plan your schedule. Making your marriage work is a choice, and it requires work. Hopefully your marriage brings you joy and satisfaction; however, there will inevitably be times when the warm and fuzzy feelings are not there. That does not mean immediately scheduling time with a therapist or marriage counselor. This challenge is an opportunity to demonstrate that you are choosing to be with this person, even when it is hard and doesn’t “feel” good. Be assertive and respectful in addressing problems in the relationship. Take responsibility and apologize for your own shortcomings, as well as forgiving your partner for theirs. 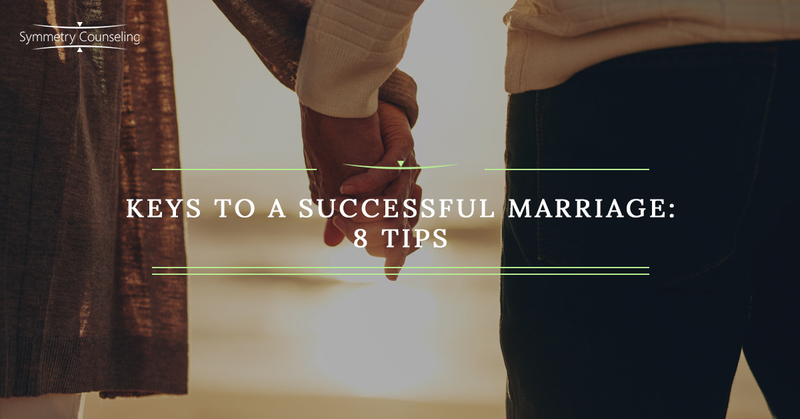 Make the effort to learn the skills that support a successful marriage. Unfortunately, many people grow up without the benefit of witnessing a truly healthy relationship, or if they do have this benefit, the skills that support the health of the relationship are not always spelled out or formally taught. Learning is an essential part of a healthy relationship. We learn through observation, by asking questions, through trial and error, and by seeking out educational materials and opportunities. Be humble enough to ask for and accept help to learn and grow in your relationship, whether that means talking to a friend or seeking the help of a counselor. Many couples find that going to couples therapy together and individual counseling separately helps them address issues and maximize their happiness together. Keep yourself, and therefore your relationship, fresh and interesting. By caring for and growing yourself, you care for and grow the relationship. Just as you should not neglect the relationship, do not neglect your own needs. Your body, mind, and spirit need nourishing in ways that only you can know and provide. Your relationship will be healthier for the time you take to exercise, spend time with your own friends or family members, work on a hobby, or pursue knowledge and education. Show daily affection in the form of hugs and kisses. Research has shown that physical touch has a strong correlation to mood and satisfaction in relationships. Physical affection conveys acceptance and a desire to be close that is essential to a healthy relationship. Some couples have meaningful routines, such as the kiss before and after work. These small routines can actually have a lot of significance in how a person feels throughout the day or in how much they look forward to coming home. In addition to having your own routine, find ways to offer spontaneous “just because I love you” hugs and kisses. This is a way to offer your spouse both safety and delight in your presence. Express daily gratitude for your spouse—thank them for something they did. Don’t allow your spouse to feel unappreciated. Notice what they do to improve themselves, the relationship, and the community. How have they made your life easier, richer and more satisfying? Communicate this to them using words, smiles, and actions. We all want others to see the best in us. Giving thoughtful and genuine compliments to our spouses is one way to nourish them and encourage their growth as a person. Giving compliments can give more assurance to your spouse that you are attracted to them physically, mentally, and spiritually. This strengthens their self-esteem, thereby strengthening the relationship without prompting from marriage counseling sessions. Give your partner some of your undivided, screen-free attention every day. Even if it just 20-30 minutes a day, make and create this time. Offer eye-contact, hand-holding, cuddling or whatever else brings you more connection. Allow your partner to feel heard and valued. Take the opportunity to share more about yourself and let down your guard to truly see and be seen. These keys will help you unlock your relationship’s full potential for happiness and satisfaction. For more information or to schedule an appointment for couples or individual therapy, please contact Symmetry Counseling.